Click the IPv6 Internet Connection Setup Wizard button and the router will guide you through a few simple steps to get your network up and running. Click Next to continue to the next page. Click Cancel to discard the changes made and return to the main page. The D-Link DIR-826L router will try to detect whether its possible to obtain the IPv6 Internet connection type automatically. If this succeeds then the user will be guided through the input of the appropriate parameters for the connection type found. However, if the automatic detection fails, the user will be prompt to either Try again or to click on the Guide me through the IPv6 settings button to initiate the manual continual of the wizard. There are several connection types to choose from. If you are unsure of your connection method, please contact your IPv6 Internet Service Provider. Note: If using the PPPoE option, you will need to ensure that any PPPoE client software on your computers has been removed or disabled. The 3 options available on this page are IPv6 over PPPoE, Static IPv6 address and Route, and Tunneling Connection. 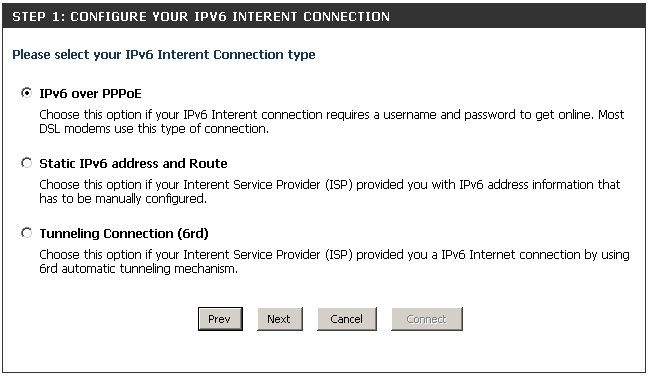 Choose the required IPv6 Internet Connection type and click on the Next button to continue. Click on the Prev button to return to the previous page. Click on the Cancel button to discard all the changes made and return to the main page. After selecting the IPv6 over PPPoE option, the user will be able to configure the IPv6 Internet connection that requires a username and password to get online.Most DSL modems use this type of connection. 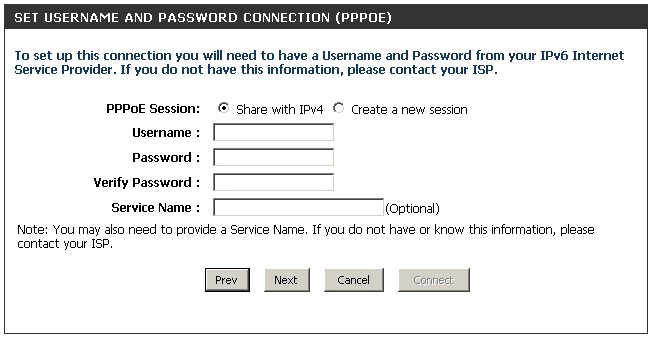 information with the already configured IPv6 PPPoE connection, or the user can create a new PPPoE connection here. User Name: Enter the PPPoE username used here. If you do not know your user name, please contact your ISP. Password: Enter the PPPoE password used here. If you do not know your password, please contact your ISP. Verify Password: Re-enter the PPPoE password used here. Service Name: Enter the service name for this connection here. This option is optional. This mode is used when your ISP provides you with a set IPv6 addresses that does not change. 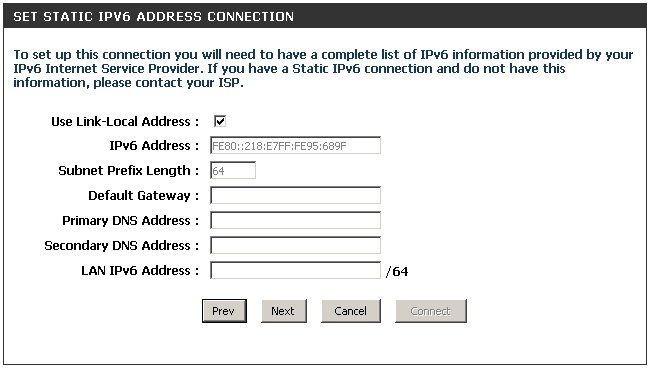 The IPv6 information is manually entered in your IPv6 configuration settings. You must enter the IPv6 address, Subnet Prefix Length, Default Gateway, Primary DNS Server, and Secondary DNS Server. Your ISP provides you with all this information. The Link-local address is used by nodes and routers when communicating with neighboring nodes on the same link. This mode enables IPv6-capable devices to communicate with each other on the LAN side. Enter the WAN IPv6 address for the router here. Enter the WAN subnet prefix length value used here. Enter the WAN default gateway IPv6 address used here. Enter the WAN primary DNS Server address used here. Enter the WAN secondary DNS Server address used here.